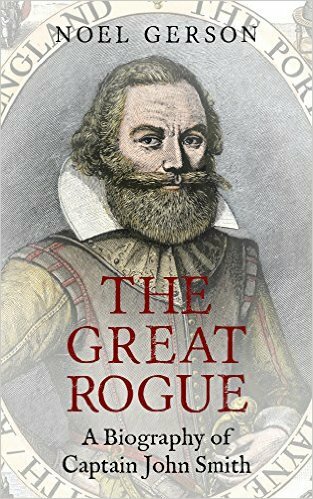 I just finished reading a book titled “The Great Rogue: A Biography of Captain John Smith” by Noel Gerson. John Smith was one of truly great English explorers. He was one of the founders of the colony at Jamestown, Virginia in 1602, The book was actually written quite a while ago (the copywright notice says 1978). It was only recently published on Kindle. The book tells the story of his early life and through his exploring and colonizing of the new world. The Jamestown colony came almost twenty years before the Pilgrims landed at Plymouth Rock. it was enjoyable read. A couple thoughts seemed to jump out at me. First that the English investors in the New World had this idea that gold, silver and precious jewels would be found as soon as the colonists landed in the new world. The second idea was that the path to the Pacific Ocean was just around the corner and up the stream. It took John Smith a long time to persuade the investors that there wasn’t gold in every hill. He did however that other natural resources were just as valuable. Those resources included lumber, furs and many other goods that were traded with the indians. He also discovered that fish and whales were abundant. Whales were valuable for their oil (used in lamps) and ambergris. Ambergris is a substance found in the digestive system of whales that was valued by perfumeries. John Smith wanted to go on the Mayflower expedition but the leaders didn’t think he was a good fit. Instead they chose Miles Standish. John Smith an outstanding job of mapping the New World. When he returned to London in 1609 after suffering serious burns, Smith returned with maps, charts and data about the new world. He never got to return to the new world but he certainly affected the development. It’s a good read. This entry was posted on July 12, 2015 at 6:15 pm and is filed under Books, Reviews. You can subscribe via RSS 2.0 feed to this post's comments.